Liberal Democrats in Cambridgeshire have launched a campaign to protect free use of computers at libraries. 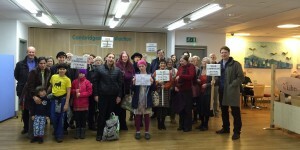 County councillors last week considered a package of measures for the future of the library service, building on workshops with the public and library campaigners as well as with councillors. The measures included several sensible initiatives, such as improving occupancy of library meeting rooms and co-locating council services — for example, showcasing assistive technology in libraries, providing support to vulnerable people. Other suggestions were to raise income to support the library service by putting on some paid-for events and maximising room income from commercial users. You can read the paper here. One of the proposals Liberal Democrats object to is charges for use of library computers. The Conservatives are proposing to introduce a £1 charge for using library computers after the first half hour. We believe that the charge will be damaging to people on very low incomes, especially to people applying for jobs – as many employers now require applications to be made on line. People on Universal Credit need to spend time job-hunting, and to prove that they are doing so. Machines to collect the charges will cost £18,800. You do the sums for how long it will take to recoup the initial outlay. I don’t think the Conservative councillors have! I also question the raison d’être of the charge, to generate revenue. Experience with bringing in charges for services has shown that usage drops off dramatically. Have Conservative councillors learnt nothing from the fiasco of their petty parking charges at the Park & Ride sites? The County Council committee responsible for libraries is the Highways & Community Infrastructure Committee, on which I sit. I am one of two Liberal Democrats on the committee; there is also one Labour councillor, one Independent one — and six Conservatives, including the chair and vice-chair. Liberal Democrat councillor Henry Batchelor proposed an amendment to scrap the computer charges. We were outvoted and the amendment fell, meaning that the charges might still be introduced. We were sorry that the Labour councillor on the committee, Jocelynne Scutt, refused to support the amendment. The Liberal Democrats have set up a petition opposing the charges. Over 500 people had signed even before the meeting. You can sign it at http://www.cambridgelibdems.org.uk/library_computer_charging. What’s all this about residents’ parking? 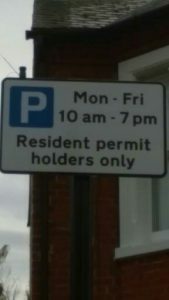 Residents’ parking could be coming to your street soon, or at any rate, a consultation about it. The County Council has embarked on a programme of parking consultations covering most of the city. Up till now, residents’ parking schemes have been developed after evidence of demand, as with the Morley scheme in this area; but following an offer by the Greater Cambridge Partnership to fund the set-up costs of new schemes, the Council is putting the idea to residents regardless of whether any interest has been shown. The Council has divided the city into 26 zones and is consulting residents in phases, presenting them with parking scheme proposals. They started with the areas where there has been strongest demand: so far, consultations have been run in the Staffordshire, Newnham, Accordia and west Coleridge zones. They have all resulted in majorities for residents’ parking schemes, although with a very low turnout in the Coleridge west area. The Victoria, Elizabeth and Coleridge East zones are coming next, and consultations for Queen Edith’s are likely to be in spring 2019. If the consultations in each area result in over 50% of responses being in favour of the proposed scheme, then they will go ahead; if not, then they will not be progressed. Labour councillors wanted to implement the schemes even without majority votes, but Lib Dems have insisted that there must be majority support. Residents’ parking schemes restrict parking during set hours to people with permits: residents and their guests, plus traders and carers. Permits cost between £1 and £2 a week depending on the hours of the scheme and all permit types are going up in price in April, to reflect rises in the costs of managing the schemes. See here for our frequently asked questions on residents’ parking, with links to the County Council’s web pages on the topic. The yellow lines in Cavendish Avenue and Baldock Way and the disabled parking bay on Baldock Way were painted in the autumn. Low-level fencing for the verges in the middle section of Baldock Way is also now in place. Yellow lines in Gunhild Close and Fendon Close have now been painted. 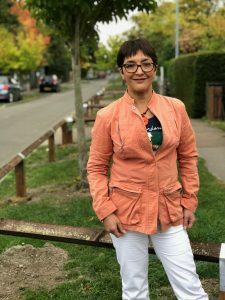 Residents in the west Coleridge area have given their backing to a new residents’ parking scheme covering the area between Cherry Hinton Road, Mill Road and Coleridge Road. The County Council ran a consultation there at the end of last year, as well as in the Accordia estate off Brooklands Avenue, in the Staffordshire Street area near the Grafton Centre, and Newnham. Just over half of the Coleridge West residents who took part in the survey supported the council’s proposed scheme. The Council will be looking at all the feedback received from the surveys and the public exhibition and considering it before it creates the final plans, which will be advertised in the local paper as part of a statutory consultation. Councillors on the Cambridge City Joint Area Committee will review all comments and objections received during the statutory consultation and they will decide on whether to implement the schemes. The Greater Cambridge Partnership Executive Board will fund the implementation costs associated with all four new schemes, meaning participants only need to pay for residents’ permits and visitors’ permits. Breakdowns of the four consultations and answers to the frequently asked questions about Resident Parking Schemes will be available at www.cambridgeshire.gov.uk/resident-parking-scheme-consultation/. Here’s some good news: next May, we’ll be able to take direct trains to Brighton from Cambridge, and next year, to Maidstone too. Travelling to Gatwick Airport is about to get easier too – through trains will mean no more struggling with luggage on the Underground. 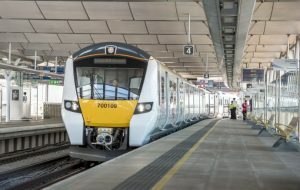 Govia has been planning improvements to Thameslink for some time but has just announced the first phase of improvements scheduled for May 2018: top of the list are new cross-London connections from Cambridge and Peterborough to the south coast via Gatwick. GTR also promise greater capacity and a new, more reliable timetable. And there are new trains too – the Siemens-built 700s are ‘smart’ trains are more comfortable and spacious. But what I most like the sound of are the RTI screens which GTR say will ‘ tell passengers how the Tube is running and where to find more space on board.’ The Reverend Awdry would have been in seventh heaven. On Tuesday, the County Council‘s Highways & Community Infrastructure committee will be considering proposals for changes to parking charges in the city, including residents’ parking permit fees as well as on-street and Park & Ride parking charges. Some of the proposals are good news, like the removal of Park & Ride parking charges, charges that we have opposed since they were first introduced in 2013. The charges have driven motorists away from the Park & Ride sites and into residential streets, which are already choc-a-bloc full of commuter cars. The rise in residents’ parking permits and on-street parking charges is not such good news. One element that my party has opposed is the very steep 88% price hike for visitor permits – almost double. We believe this is not only disproportionate but very unfair on people who regularly have visitors during the day, such as the housebound. There are lower rises for residents’ permits … happily no rise for the new Morley scheme in Queen Edith’s that is just being introduced. I am a member of the Highways committee and welcome your comments, which I will feed into my comments at the committee. Please note that the charges have already been considered by the city-county councils’ joint traffic committee, where I and other Liberal Democrat members challenged the level of the rise in visitor permit costs, which we believe is over the top. We were disappointed – and not a little surprised – that our Labour colleagues defended this. You can read the report at https://cmis.cambridgeshire.gov.uk/…/Com…/7/Default.aspx. The meeting is open to the public; if you wish to speak, you need to notify the County Council by noon on Thursday. Work has begun on a residents’ parking scheme. The new scheme will be known as ‘Morley’ after the primary school on Blinco Grove – and will ipso facto also share a name with Liberal MP and founder of Homerton College, Samuel Morley. It will include Blinco Grove, Marshall Road, Hartington Grove, Rathmore Road & Close and Rock Road, plus 151-219 Hills Road and Cherry Hinton Road from the Cambridge Leisure junction to no. 196. The first stage of the installation is putting up signs near the bays explaining the restrictions –10am –7pm Monday-Friday. During these times you may only park with a permit. The signs are a legal requirement, and need to be near the parking bays to allow the County Council to enforce the restrictions and to protect itself against challenges by motorists. There are rules about the distances between the signs and the height of the poles on which the signs are mounted. I know that some people have been unhappy about the positioning of the poles so I caught up with the contractors this morning to have a chat. They’re very approachable and said they’d had a friendly reception from most people, and even a few cups of tea. 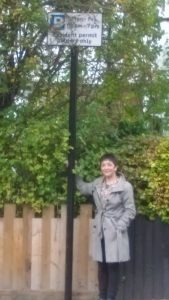 They work to instructions from the Council about where they put the poles, and that has to comply with national regulations – but it is sometimes possible to tweak the positioning, bearing in mind other constraints such as services under the ground. If you are unable to talk to the contractors, please drop me an email and I’ll do what I can to help. The next stage will be painting residents’ bays, white H-markings and yellow lines, and the scheme is set to launch on 3rd November. Conservative councillors have voted en bloc to close 19 children’s centres across the county, including Homerton, Romsey Mill and Cherry Hinton in this area. The decision has been met with widespread dismay from parents concerned about the loss of vital services, including post-natal care, parenting classes and work with troubled families – all for a £1 million saving. Nearly 4,000 people signed a petition set up by me with other Liberal Democrats which called on the Conservatives to reverse their proposals. Many families attended the council debate on Tuesday, including some from this area, and eleven people spoke on the importance of children’s centres. This is a brutal decision, which will cause lasting damage to many children and families. Early intervention with children is vital, and I fear that problems not picked up when children are young are likely to become more embedded, costing more to put right in the long run. The decision is even more sickening when you remember that only a few months ago, Conservative councillors voted themselves a massive pay rise. As there have been lots of questions about residents’ parking, here is an update. The Morley area of Queen Edith’s will have a residents’ parking scheme installed in the next few weeks, following majority support last year. The County Council informs me that Skanska will be installing signage mid-October and having yellow lines painted at the end of the month. Residents should expect letters from the County Council announcing that the scheme is about to be launched and inviting permit applications. There will be notices in the street to alert everyone else. The details of the Morley scheme are on the Residents’ Parking page of the County Council’s website: . The County Council is about to launch a ‘Coleridge west’ consultation in the area borded by Cherry Hinton Road (north side), Coleridge Road and Mill Road. Surveys for other areas of Cambridge will follow to establish whether there is a general desire for residents’ parking. In this area the designated areas are Coleridge east, Glebe, Wulfstan, Nightingale and Perse. Schemes will only be taken forward if a majority of respondents are in favour. 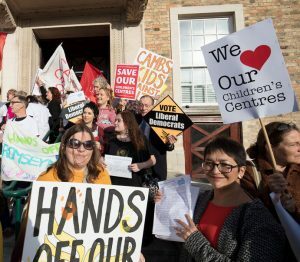 The councillor who chairs the Cambridgeshire County Council Children and Young People Committee, Simon Bywater, has announced that the debate on the children’s centre closures will be pulled from the 10th October committee meeting, and will instead be on the agenda of the full council meeting on 17th October. This means all county councillors will vote on the proposals. “We have had a good response to the Children Centre Public Consultation with over 2000 completed responses. We welcome the level of detailed feedback and engagement we have had during this period of consultation and understand that whilst there has been some substantial support for the proposals from many residents there is also concern from others about some of the proposals. 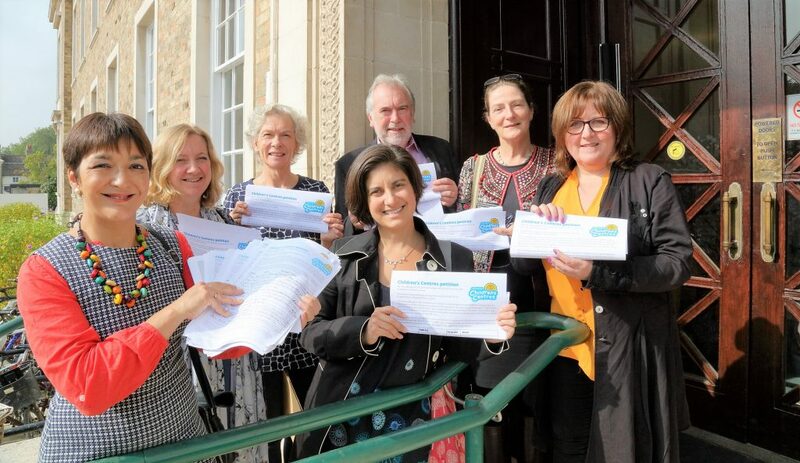 Today, I went to Shire Hall to hand in our petition opposing the children’s centre closures, now on over 3,800 signatures. We will present it on the 17th October. This meeting will be open to the public, but if you wish to speak at the meeting you must inform the council by 10th October.